We need to localize this story — I know! Stereotypes! My editing job can be fast-paced and involve multiple deadlines within a shift. Thus, when I’m fact-checking and editing for content, grammar, etc., I don’t often read more of the story than needed to verify the summary’s accuracy. Thus, I’m not reading nine pages online of the New York Times magazine to fact-check this two-sentence summary. But occasionally the source story is short enough, or something catches my eye, and I’ll take a moment to read on. Usually, it’s a particularly inane or inappropriate headline from the “most read” tab on the side of most news sites. While editing a summary about Hindus in Ireland the other day, however, I found a copy editor’s dream: Stereotypes, in list form. The site carrying the story in an English-language Indian site, I believe. But more importantly, the story is syndicated through ANI, or Asian News International. Therefore, ANI is pretty sure its audience has no idea what Ireland is like. So, it’s helping out those people. I think. 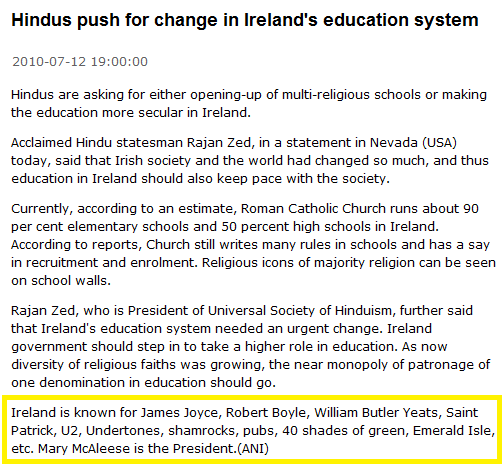 Thankfully, Joyce, Yeats and St. Patrick get mentioned, albeit on par with shamrocks and pubs. I suppose it’s tough at this point to quibble with U2, though mentioning Bono alone may have sufficed. Potato famines were snubbed, as was Maureen O’Hara. Wait, what was my point? Oh, yes. When you give your readers/consumers information, don’t treat them like they’re idiots, and make sure the information is relevant (and productive, if possible). Also, don’t screw your reporter/writer. My bet is that an editor inserted the final paragraph after what was a solid and concise article, if a bit short on details. And if not, the editor could have excised it and didn’t. Either way, come on!